rom the 1930's through the 1960's, English-made 3-speed bicycles were, in some respects, the ultimate in human-powered transportation. They spawned a vibrantly active club culture that has never been equaled. The bicycle provided unprecedented individual mobility to the British working class. roadsters were the old-fashioned style of bicycle popular in the countryside. They usually had 635 mm (28 x 1 1/2) wheels with Westwood rims, long cranks and long wheelbases, and very shallow frame angles (68 degrees or less.) Roadsters used "roller-lever" brakes operated by rods, instead of cables. The typical roadster would also be equipped with a "gear case", a chainguard that completely enclosed the chain. Roadsters have never been truly popular in the United States, but they are not truly rare, either. Most roadsters that were imported to the U.S. do not have the gear case, because U.S. customs regulations placed a higher duty on bicycles weighing more than 40 lbs. As of 2016, roadsters are still manufactured in India and China and are common in third-world countries. ports or "light roadster" bicycles were the basic transportation of the urban working class. They feature 590 mm (26 x 1 3/8) wheels with Endrick or Raleigh-pattern rims, full steel fenders (or "mudguards" to the British) "North Road" upright handlebars, and cable-operated brakes. Sports bicycles had rather more nimble frame geometry, typically with 72 degree frame angles. These bicycles were faster and lighter than roadsters. The vast majority of English bicycles that made it to the United States fall into this category. lub bicycles were the elite, high-performance machines of their time and place. They were named for the fact that they were the style of bicycle popular with members of the many active cycling clubs. The poorer, less performance-oriented club members would ride sports bicycles, but the more hard-core "clubmen" would have true club machines. A club bicycle would typically have Reynolds 531 frame tubing, a narrow, unsprung leather saddle, reversed North Road handlebars (or drop bars), steel "rat trap" pedals with toe clips and 597 mm (26 x 1 1/4) or 630 mm (27 x 1 1/4) wheels. Even fairly high-end models used steel rims, which, at the time, were widely believed to be superior to aluminum. The steel Dunlop Special Lightweight rims used on the better club bicycles could give the aluminum rims of the day a run for their money. Club bicycles would be likely to have a more exotic Sturmey-Archer hub, perhaps a medium- or close-ratio model, 3 or 4 speed. A very few even were equipped with the rare ASC 3-speed fixed-gear hub. Many club bicycles were single-speed machines, usually with a reversible hub: single-speed freewheel on one side, fixed-gear on the other. Starting in the late '50's, derailers began to be used on this type of bicycle as well. any younger mechanics are unfamiliar with some of the idiosyncrasies of English-made 3-speed bikes. Nevertheless, there are an awful lot of them still on the road, because they were built to last, and they still come in for repair. An all-around bike mechanic should be up to speed on these bikes. These bikes are actually very easy to work on, but you do need to know a few of their quirks. he French term for "adjustable wrench" is "clé anglaise" or "English wrench". There is good reason for this, because older British machinery used a different set of standards, called "Whitworth" for wrench sizes and screw threads. Some of these sizes are close enough to Metric or S.A.E. sizes that you will be able to use your normal wrenches, but you will probably need to use an adjustable wrench as well. efore you start to work on an English 3-speed (or a low-end English 10-speed), you should figure out who made it. By 1962, Raleigh or its parent company, Tube Investments (TI bought Raleigh in 1960) had gobbled up most of the smaller English manufacturers. In its enormous Nottingham factory, Raleigh built bikes under many names. It is important to know whether a bike was built by Raleigh because the Raleigh bikes were built to Raleigh dimensions, and other English bikes were built to British Standard dimensions. The major areas of concern are headsets and bottom brackets.Non-Raleigh British bikes use B.S.C. parts, which are readily available. Raleigh used its own unique 26 threads-per-inch parts, which are not interchangeable with anything else. This is particularly a problem if you need to replace a fork on a Raleigh-built bike, because you will also have to replace the headset if you cannot locate a 26 TPI fork. Fortunately, the press-fit dimensions on the head tube of the frame are the same for both. If you are not satisfied with cottered cranks, and want to upgrade a Nottingham Raleigh frame to cotterless cranks, you will have to re-use the old cups unless you are prepared to spring for a Phil Wood bottom bracket, or a Velo Orange threadless bottom bracket -- see article on cartridge bottom brackets. The inner diameter of Raleigh cups is a bit smaller than standard. Many bottom-bracket axles will not fit unless you replace the standard 1/4" bearing balls with 15/64" or 6 mm bearing balls. Because of the wider BB shells used on Raleighs, you will need a J.I.S. 5 or 7 series axle. Alternatively, it is possible to re-thread Raleigh bottom brackets to standard British (24 TPI) threading, but this will weaken the threads. Also see my more detailed article on Raleigh headset and bottom-bracket dimensions. ost front wheels can be installed without regard for which side is left and which side is right. This is not the case with Raleigh 3-speeds. Raleigh front hubs usually don't have cone locknuts. Instead, they have one cone with wrench flats, the adjustable cone. The other cone is round, with no place for a wrench. The non-adjustable cone is supposed to screw down all the way on the axle until it runs out of threads (there is a raised shoulder on the axle for this purpose). All adjustments are to be made with the adjustable cone. The fixed cone must go on the bicycle's right, the adjustable cone must go on the bicycle's left. On the left side, the axle nut will keep the left cone from loosening up. If the wheel is accidentally reversed, so that the adjustable cone is on the right, it can tighten itself up and ruin the hub. Up through 1952, front Dynohub (hub generator) axles had the adjustment on the left, but newer ones have it on the right -- see article on Dynohubs. Also note that incorrect disassembly of a Dynohub will permanently weaken the magnet. Raleighs also used an unusual wheel retention feature. The axle slot in the front fork end is keyhole shaped. Older hubs came with special axle nuts and washers. The axle nut had a shoulder which fitted through the axle washer and into the round part of the axle slot. Later hubs have a shoulder on the cone which fits into the round part of the axle slot, and it is necessary to spread the fork blades a bit to get the wheel in or out. This is the more common arrangement. I have a separate page on Raleigh 3-speeds with more identification information. 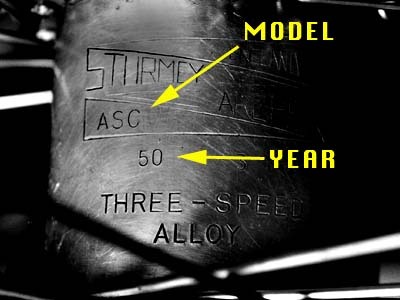 That page includes links to several other pages with extensive information on setup and servicing of Sturmey-Archer hubs -- 3, 4, 5 and 8 speeds, old and new. Read that page! Most old three-speed bikes have the gear range set unreasonably high -- and that page will tell you, among other things, how to correct that problem. ost English 3-speeds use brake calipers that are adjusted differently than conventional sidepulls. They usually have a slot for a flat-head screwdriver on the end of the center-bolt. This is used differently depending on the brand. lder Raleigh brakes are identified by the special cables they require. These cables do not use anchor bolts. Instead, they have soldered lugs at both ends. Replacement cables came with the adjusting barrels. To replace them, you would remove the nut that held the old adjusting barrel fitting to the caliper, and switch over the whole assembly. When available, the cables came in three varieties: "front", "gent's rear" and "lady's rear". The "lady's rear" was longer and had the adjusting barrel facing the other way. Good luck finding replacements today. Every time you service a "lady's" three speed, drip some oil down the rear brake cable housing at the caliper adjusting barrel and squeeze the brake lever a few times to work it in. Since the lower loop of housing is open upward to the elements, it can fill up with water and rust solid if not kept well-oiled. When outdoor temperatures are below freezing, the brake can work fine when first taken out of a heated area, then freeze up! The center bolts on "Raleigh-type" brakes are not adjustable. The spring block has a shoulder that is made to be just the right length so that the caliper arms can move freely. The spring block has a plain, un-threaded hole, so tightening it with the screwdriver end is the same as tightening the nut that holds the caliper to the bike. hillips-type" brakes use a conventional cable anchor bolt and a regular single-ended cable. Unlike with the "Raleigh-type" calipers, the center bolt is adjustable. Much as with Shimano sidepulls, turning the center bolt (with a screwdriver) adjusts the free play of the caliper arms. Unlike with Shimano sidepulls, there is no separate locknut, so the same nut that holds the caliper to the bike acts as a locknut. Both "Raleigh-type" and "Phillips-type" brakes usually have a fiber washer between the two caliper arms on the center bolt. This should get a drop of oil from time to time. t is also important to remember that although 3-speeds usually take "26 inch" tires and tubes, they are not interchangeable with mountain-bike size 26 inch rubber. The vast majority use the English 26 X 1 3/8 size. This has a different bead-seat diameter (I.S.O.590 mm), and will only take tires marked 26 X 1 3/8. This size is also sometimes designated "E.A.3". Occasionally, you may run into a "high performance" English 3-speed that takes 26 X 1 1/4 (E.A.1, 597 mm bead seat) tires. Older Schwinn 3-speeds used a 597 mm tire marked "26 X 1 3/8", also referred to as S-6. Schwinn 26 X 1 3/8 (S-6) tires are NOT interchangeable with English 26 X 1 3/8 (E.A.3). Surprisingly, the Schwinn 26 X 1 3/8 (S-6) has a 597 mm bead-seat diameter, and IS interchangeable with English 26 X 1 1/4 (E.A.1)! I also have a more detailed article about 26-inch tire sizes. There are other 26-inch sizes as well! "28 X 1 1/2" (635 mm) tires used on some rod-brake 3-speed roadsters are a distinct size of their own, and should not be confused with 700C (622 mm) tires which are sometimes also referred to as 28 inch. Raleigh models featured the "dimpled fork", a fork with a tubular crown and chrome-plated buttons on the ends of the crown. The Raleigh logo depicts Sir Walter Raleigh laying his cape down in the mud so that Queen Elizabeth won't soil her shoes. Other Raleigh logos represent a heron, for reasons that are unclear. Rudge had some connection with Whitworth, and some Rudge parts are labeled "Rudge-Whitworth". See my glossary entry on "Whitworth." Humber models often feature a truly bizarre fork design, where upper part of the each fork "blade" consists of two small diameter tubes, one in front of the other, joining halfway down the "blade". Humber chainwheels have cutouts representing 5 little people running around in a circle, with their feet outward, and their heads joining at the middle. Humber was also an automobile manufacturer, but I believe the bicycle division was spun off early in the century. The Humber is a major English river. A generally low-end Raleigh model. B.S.A. (Birmingham Small Arms) was an important independent manufacturer until the bicycle division was sold to Raleigh in 1957. Originally an armaments company, its logo represents 3 military rifles stacked in a tripod. B.S.A. was the originator of the threadings and frame dimensions that later became B.S.C. and more recently ISO. B.S.A. was also a notable motorcycle manufacturer. A conglomerate, owner of Phillips, Hercules, Norman and Sun, a division of TI. The B.C.C. brands were merged with Raleigh in 1960 when TI bought Raleigh. An independent maker. "C.W.S." stands for "Cycle Wholesalers' Service"
An independent manufacturer, still in business. A large multinational, now based in Kent, Washington, Derby bought Raleigh Industries from TI in 1987. Derby also owns Raleigh USA (a separate company from Raleigh Industries), Kalkhoff, Nishiki, Univega, Haro, Cycle Pro and Diamondback. Dunelt was a second-rank brand. Many Dunelts feature a fork similar to the Raleigh dimpled fork, only with a flattened top. An independent manufacturer. See My Elswick Page. A house brand of Boston's Jordan Marsh department store chain. A Raleigh brand introduced in 1938. This became the primary name of Raleigh's subsidiary in the Netherlands. A house brand of Eaton's department stores in Canada. A division of B.C.C. until merged with Raleigh as part of the TI takeover in 1960, Hercules was a major competitor of Raleigh, with a strong sporting image. Hercules sponsored popular racers, most particularly Ken Joy and Eileen Sheridan. Hercules made its own 3-speed hubs, which were pretty-much identical to the older Sturmey-Archer AW, though some parts, notably the right ball cup, were not interchangeable.. Hercules hubs continued to use threaded drivers long after Sturmey-Archer abandoned them. Although primarily known for low-end department store bikes, Huffy sold Raleigh-built bikes under its own name in the 1960s. Huffy was also the first U.S. importer of Moulton bicycles. A division of B.C.C. until merged with Raleigh as part of the TI takeover in 1960. Normans featured decorative chainrings where the spokes were in the form of Norman warriors. A division of B.C.C., Phillips, based in Birmingham, was the second-largest British bike maker until merged with Raleigh as part of the TI takeover in 1960. Raleigh-made Phillips models are near the bottom of the quality range. Birmingham Phillipses often featured a chainwheel with the word "Phillips" prominently featured in the cutouts. A mid-level Raleigh brand, successor to Gazelle. Read about My Old Robin Hood. A division of B.C.C. until merged with Raleigh as part of the TI takeover in 1960. A division of B.S.A., until absorbed by Raleigh in 1957. Early Sunbeam bicycles had a unique oil-bath chain case which also lubricated the rear hub and bottom bracket. Taken over by Raleigh in 1954. This large conglomerate, parent company to British Cycle Corporation, bought Raleigh Industries in 1960 and merged Raleigh with the B.C.C. brands Phillips, Hercules, Norman and Sun. Triumph was a second-rank brand. Raleigh bought the bicycle rights to the name from the Triumph motorcycle company in 1954. There's no connection to Triumph automobiles. on't sneer at old 3-speeds. They are serious bikes, built for serious use. They are meant for utilitarian cyclists, and they are still extremely appropriate for riders who don't usually go more than a few miles at a time. They are particularly at home in stop-and-go traffic, because they can be shifted even while stopped. Their English heritage: full fenders, oil lubrication, and totally enclosed gear system, makes them relatively impervious to wet conditions. They may be heavy. That is not because they were built to be cheap, but because they were built to endure extremely rough usage and neglect. Properly cared for, they will outlast us all.